We have the cutting edge equipment you’re looking for, but we also have something that is far more important: an experienced engineer who knows his studio inside and out, a comfortable creative workspace, and the biggest drum sound in Silverlake. With floated hardwood floors, high ceilings, and an asymmetrical floor plan, Silverlake Recording Studios’ tracking room sounds great and is a relaxed comfortable place to work. The floated hardwood floor and high ceiling of our main room make it a great place to track drums, full bands, small string ensembles, horn sections, or multiple voice over artists at once. The open floor plan, inspired by the production techniques of today’s top producers including Daniel Lanois and Brian Eno, brings the artist into the recording process. With the artist and engineer in the same room there is a synergy that helps you capture your best performances. If isolation is what you’re after, we have an isolation booth that is perfect for an upright bass, a Marshall stack, or an intimate vocal or voice over. 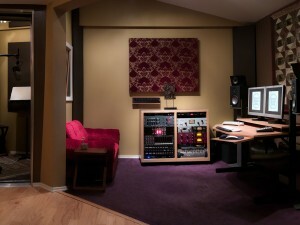 Silverlake Recording Studios is built around a boutique and vintage front-end and a digital back-end. Our extensive mic collection through high-end vintage and boutique mic-preamps and compression into a Mac Pro running Protools HD 2 accel will assure that you get the sound you are looking for with any of the colors you want. We have a vast array of vintage drums and guitar amps. We also have the latest plug-ins, editing and pitch correction software to make you sound your best. In addition to state of the art gear, the key to Silverlake Recording Studios is it’s owner/chief engineer, Darren Elpant. He is a graduate of Berklee College of Music, is Emmy nominated, and has been in signed bands. He also has a drum loop library in collaboration with P5 Audio. His recordings can be heard all over the world on radio, television, and in movies. Darren can record, mix and play anything you can throw at him, from classic country to new rock to experimental electronic music. Darren is an accomplished session drummer with major label credits and can provide drums for any project you bring to him. His encyclopedic knowledge of musical styles combined with his recording skills means he can emulate the sounds of all your favorite recordings or move into fresh territory. Darren’s musical diversity and years of professional experience will ensure you to realize your musical vision.